Product #60523 | SKU 2-801 | 0.0 (no ratings yet) Thanks for your rating! A single-axis lens control system with room for expansion. 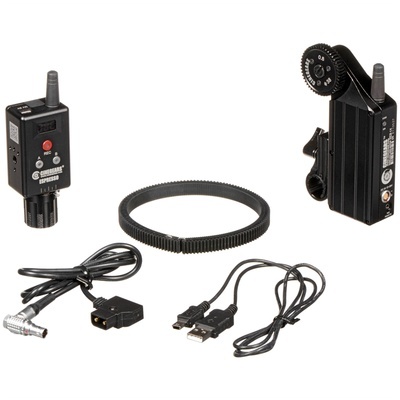 The Cinegears Mini Controller Basic Kit allows you to set up a wireless lens control system on your camera system, equipped with either a cine-style geared lens or lens that does not feature a focus gear. The Mini Controller features a built-in rechargeable battery with approximately eight working hours of power per charge, offers 15 selectable speeds, and allows you to programme up to two focus presets. It incorporates a start/stop record trigger button and small LED screen that shows focus depth. The kit comes with a 19mm rod clamp bracket and 19mm to 15mm adapter bushing, so that you can mount the motor on either 15mm or 19mm support rods. Included with the kit is a customisable rubber gear that you can mount on a lens lacking the necessary cine-style focus gear. The motor comes with a cine-style drive gear that can be swapped out when using ENG-style lenses with either Canon or Fuji-style gearing (replacement gears not included). This basic kit fits into a waterproof case with foam inserts to protect your equipment during transport and while in storage.